Tradecorp Construction Group are the experts in complete turn key commercial office fitout solutions. Whether you’re searching for a refurbishment to an outdated office environment or a completely new fitout from scratch, we have the expertise to transform your office or retail space into an inspiring place to work and do business. With over 10 years experience creating commercial fitouts for thousands of Sydney businesses within the Sydney CBD and beyond, our team of office renovation experts have a wealth of knowledge and experience to share with you. At Tradecorp Construction Group we are not about cookie cutter solutions. We understand that every business has unique requirements. We focus on working closely with you to take your ideas out of your head, onto paper and into reality. Throughout the fitout process our team will ensure that your project runs to time and requirements. We’ll make reccommendations to you throughout the process, update components of your commercial fitout plan as necessary and make any modifications you desire because your satisfaction is our ultimate priority. We employ only the most highly qualified tradespeople in the industry, ensuring that the office fitout you receive is the very best quality. 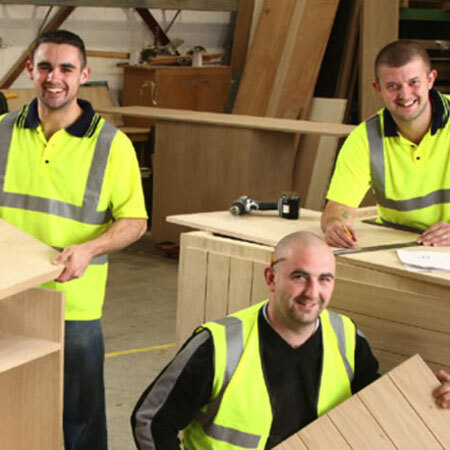 We support all our work with a written guarantee to provide you with the confidence that your fitout will be completed to time and standard as promised. We pride ourselves on exceptional customer service. We’re focused on building a long term relationship with each and every one of our customers, to ensure that your office fitout not only meets but exceeds your expectations. Our services range from initial office design through office partitions, office workstation set up, office data cabling, office ceilings, office floors and more. If you’re moving offices we also offer a ‘make good’ and removalist service.